He had a hectic work life that left him with little or no time for exercise or any form of fitness regime. It was all work and no play for him. His sedentary lifestyle got the better of him. As a result his eating habits were erratic with no control on what was being eaten. The net result of all this was he had gained weight apart from being unhealthy. The best part was that this 31 year old young man was aware of his issues and was keen on rectifying the situation. And, adapt a healthy lifestyle for a better future. However, he knew he had to make an effort to achieve his goals. 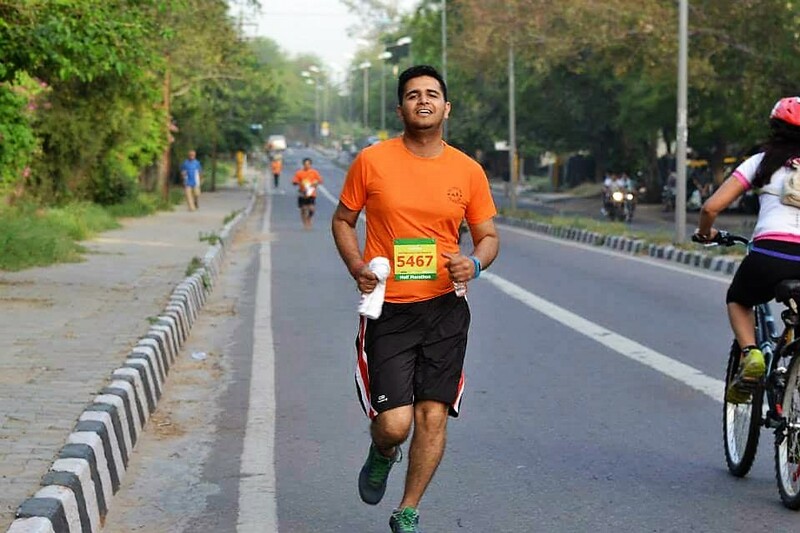 Abhinav Sharma’s story in his own words on how he achieved his active lifestyle and health back. I work in the travel industry and have a very hectic work life due to which I led a very sedentary life style with no activities of any sort. I realised I was becoming nothing more than a couch potato and wanted to change. I tried to gym but could not sustain it. I then started looking for other solutions. I was looking forward for some options which I could follow and better my lifestyle. During the process of my research I came across GOQii. I got to know its features and one of the main things that attracted me was the unique human touch along with technology. I came on board GOQii as a beta player two years ago. Personalised coaching attracted me and that was also the motivating factor. I knew that if I had to achieve my goals I would need someone to motivate and push me constantly. As soon as I came on board GOQii, I got Shimpli Patil as my coach. She took me through the GOQii ecosystem and explained the whole process which I found very interesting. Then she educated me about real fitness and how you could achieve an active lifestyle and your health goals by taking small steps initially and then gradually increasing the process. She also told me about water intake and also how in the office and while I am travelling I can keep myself active. And finally, she improved my dietary and nutrition habit. I learnt how a good and balanced diet plays an important part in fitness and overall health. I did exactly what my coach asked me to. It wasn’t easy at all for me to bring about the changes, follow a routine. I would get tired easily but, I was sure I wasn’t going to give up. Soon, walking for 30 minutes became 45 minutes and then an hour. I then added strength training to my fitness and I gradually started walking the path of a healthy and active lifestyle thereby clocking 10,000 steps daily to the current 12000 steps daily. After a year of being on GOQii, I participated and successfully completed the 100 km Oxfam Trailwalker in November 2015. Now my daily routine includes regular exercising- basic free hand exercise as suggested by my coach and after that I leave for office around 8:30am and in between office hours I take breaks, go for a walk and use the stairs now instead of taking elevators thereby also increasing my step count. Along with moving and achieving my daily step count I also overhauled my diet. My diet now includes salads, veggies, lentils and fruits. Now, I know about good and bad foods, which is the right diet for me etc. My water intake increased to 3 litres from a mere one litre earlier. My initial health goals when I came on board GOQii was two pronged. Firstly, to achieve a healthy lifestyle and secondly control my weight. Due to my hectic and erratic work schedule I gained lots of weigh. Having achieved my goals, I can now proudly declare that my lifestyle has become active but, I still need to achieve more. My weight is also under control thanks to the changes in my diet. I am glad that I am now a part of the GOQii active family. Going for active Sundays here in Delhi and I have met so many like-minded individuals from GOQii family and it only inspires me further. A big thank you to my coach who has been constant source of motivation at every juncture of my journey be it in good times or when I have been low. Infact, Shimpli has been my motivator for the participation in the 100 km Oxfam Trailwalker. At first when she told me about it and asked me to participate, I did not believe her. I did not think I could achieve my goal of completing 100 km within 48 hours. My first thought was it is really impossible to do that but, my coach told me that it is possible. I then participated in 2015 after a year f achieving some fitness levels. Oxfam Trailwalker was an eye opener. I met so many personalities and people both young and old and watching them be so fit and walk so much was inspiring and motivating at the same time. My biggest question to myself was.. if they can do it why can’t I? That environment was conducive for someone like me to share my experience and listen to others too. Overall it was truly an outstanding experience. What does coach Shimpli Patil have to say about Abhinav Sharma? When I had my first interaction with Abhinav, he described himself as a ‘Lazy Person’. He had some really good health goals in mind to achieve but lacked motivation and the right push to achieve them. After a quality chat with him, I explained to him why it was important to achieve those health goals and how we could work together towards achieving these. Abhinav was convinced and decided to go for it. Time was a challenge for him but, he was ready to realign his schedule in a way which could fit an exercise routine in the morning. He took the time to regularize his daily regime but, yes he could pull it off gradually. Jogging, core exercises, body weight exercises. We moved ahead step by step. The best thing about Abhinav was, he never said NO and when I added extra exercises to his routine. He paced up and he decided not to put a full stop and keep at it. It is not exercises alone that we worked towards, he also brought about dietary changes wherein I introduced him to the concept of pre and post workout meals, some mid meals (to cut the large gaps between meals) and he learned to keep his dinner light yet balanced. With these wondrous dietary changes along with regular workout routine, there was no doubt he could reach his goals. After few months he noticed a drop in his inches (Fat loss), increase in stamina and endurance while he jogged and ran. He kept feeling better each day. One day, after having shared his progress with me, he asked me now what next? And I immediately said ‘Let’s Walk 100 km within 48 hours’. ‘You are all set’, I said and he was dumbstruck for few seconds. I made him believe that ‘HE COULD DO IT’ and should have confidence in himself. He decided to take up this incredible challenge. And, guess what he completed it gracefully. “When you have the will, you can achieve anything that you want!” That’s what Abhinav has proved. Superb story, it was all done through his will power, motivation and guide by coach & diet.